Hey guys, this is not for an assignment, but CAVE, the virtual reality-type world Danny mentioned in lecture is at WID. I think it is open to the public this week. I wasn’t sure what all actually constituted as a computer, but my boyfriend said it could actually be many electrical things, so here is my use in one evening. Cell phone– I texted people throughout the evening. Sometimes they were two hours away, sometimes they were in the same room as me. I also talked to a few people on the phone. Television– I watched the Big 10 Championship (Go Badgers!) and a little bit of the Oxygen channel. Laptop– I quickly checked my Facebook and e-mail, and then spent a good deal of time reading for a class before the game. Microwave– I heated up leftovers. I was surprised by this one, but I guess this is really computerized. It’s funny, I just always thought of computers as standard screens with keyboards and a modem. It was really interesting to find out that many electrical things have computers in them. It makes you think about how vital the computer has been to our every day lives without our awareness of it. After reflecting on this blog post, I actually think I use laptops/desktop computers less as entertainment and more for school and work. I don’t know if this is because I’m not as obsessive with Facebook as I used to be, or if schoolwork has gone away from pen and paper and transferred over to the digital realm. I think it’s both. After using LambdaMOO for quite some time, I have found that’s its equivalent seems to be today’s chat room. People sign on to LambdaMOO, see who is online (by typing @who), and go into actual created rooms or areas (like the Marine Rabbit Colony or the living room) to chat with people. Another similarity between LambdaMOO and modern day chat rooms. Both have a base of users that come fairly often to the chat room, known as regulars. While there are regular users, some people jump on to chat rooms infrequently, just to check it out. I think I fall into this category of people. But there are many users who frequent LambdaMOO and have built a community, sharing stories, daily information, and even recipes. While LambdaMOO has its differences from today’s chat rooms, they each have similar qualities that offer users to talk to, connect with, and share with one another. I watched an episode of “American Horror Story” on Hulu and a video on YouTube (Look At This Car!! http://www.youtube.com/watch?v=EF8GhC-T_Mo ). When comparing the two, I found that they both had advertisements, however the YouTube video’s advertisement was a banner ad at the bottom of the video, whereas the Hulu ads were more like short commercial breaks. This makes me think of Hulu as a sort of T.V. provider, which in some sense it is. The quality of video on Hulu is much sharper than YouTube, which also lends an air of it being more professional and official content. The video “Look At This Car! !” is very obviously amateur, as there is someone taping another guy interact in a funny conversation. I like this about YouTube, however, because there are a lot of things that happen in life that are random and funny, and it’s cool when you can capture that and share that experience. There was one other thing I found interesting when I compared the two. On the Hulu site, when you are searching for certain T.V. 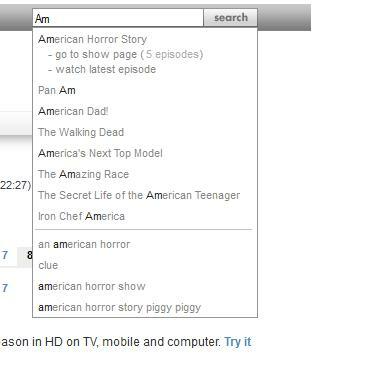 shows, the search results look at the letters you type in and match those letters with the most popular show. 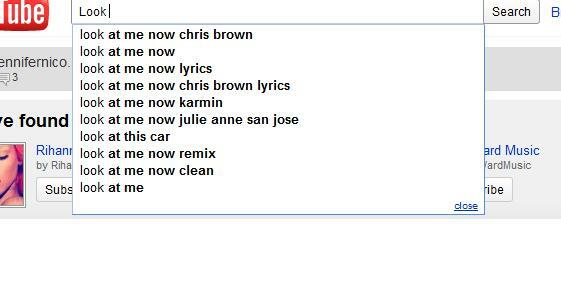 So when I type in the letters “Am” I get results of “American Horror Story,” “Pan Am,” and “American Dad!” When I type into YouTube’s search the word “look” I see the video I was searching for in the results, but see several versions of the song “Look at me now” by Chris Brown (which, on a side note, has an awesome rap by Busta Rhymes) that come before it. This is an exception, because most times when you type in a word, you don’t even see the amateur video you were looking for in the auto search. Because Hulu is automatically linked with professionally made shows, the ones you are looking for show up in your search. But YouTube has so much amateur as well as some professional content, that it seems as though the professional content (like songs) show up, and the amateur content has to be sought out. Copyright didn’t bother me as much when I was younger. I used to copy and paste any image I wanted from the internet, download music from Limewire, and share music with others. I felt invincible, like no one could stop me from doing this things…except maybe my mom when I starting downloading viruses on the computer. Now that I’m older, I think I’m more conscientious of the way I use and share media online. When I got senior pictures done 4 years ago, I posted them online, but tagged them to the photography studio that took them. When I watch videos online, I don’t personally download anything from illegal sites, using Hulu, or a T.V. network’s site to access the content. I post videos on YouTube and make sure they don’t have songs or other information that could be considered as stolen. However, I have experienced copyright violation in the past year, even the past week. There have been a few times when I have copies pictures from Google image search to put as my profile picture on Facebook (ex: Final Harry Potter movie poster before the movie was released in theaters!!) When I wanted to watch a show with my boyfriend this past week, he downloaded it illegally to watch it. A different friend posted a video on YouTube that got taken down because of infringement. Yet another friend downloaded a TERABYTE of movies onto his computer last month because all his movies got lost. Charter contacted him and basically said stop, or there will be further action taken. So, while the consequences of copyright seem more real to me and others, there are times that we still do tip-toe the line of legality and figure out how much we can get away with, sometimes crossing the line a bit too much. The Wikipedia entry for LambdaMOO had a lot of information about the site outside of actually using the site, so I found it sort of hard at first to incorporate any information into the set categories they had. I was going to try and create a new category called “Commands” and list the different types of commands used on the MOO, but then Wiki editing uses some code that I didn’t want to mess up. I changed/added to things to the entry, however. The first change I made is highlighted below. The original sentence said after jumping off the world that it would disable your account for “an amount of time.” Having actually almost jumped off the world, I knew this amount of time was three months, so I made the changes. Another addition I made is also below. The Wiki entry talked about the original geography of the MOO, but not any current geography, so I added in a sentence with this information and an “@ command” that allowed me to show some knowledge of how to use commands in the MOO, too. I think it was actually sort of cool to be able to change the Wiki page. It’s something that so many people look at, and if even one of my changes stays I think that would be really cool. When I searched for “Jenny Weeden” on Google, the first thing that came up was my Facebook page…big surprise. The next couple of results were other different social networking sites that I had never heard of before with a user named Jenny Weeden. A couple other results were yellowpages type sites that found people with my name in Mississippi and the US. There was a link to a site with a press release kind of thing that was talking about a girl from the military with my name. The next link was to a blog site (The Hospital Word Press) that has a short story I’ve written on it, and after that, a press release from when I was a senior in high school about a scholarship I received. The final two links were college related- one from a social network called campus buddy that I forgot I even had an account on, and another social network type site that I know for a fact I haven’t signed up for, and has information about me that I wasn’t even aware I had shared. I was really surprised I actually showed up on the Google search, but even more surprised that the final site on the first page of search results has information about my college extra-curricular and other things that I just generally don’t talk about that much. It really creeps me out that this profile exists and I will definitely be doing some research to make sure that my identity is not being compromised.